Canal Place 206 - Cute Studio recently renovated! Property Size 550 sq. ft. This cute studio condo on Holiday Isle has recently been renovated with new paint, floors and appliances. The condo has a queen size murphy bed which makes this studio surprisingly spacious. The living area also has a love seat and full sleeper sofa. There is a new smart TV (roku) and nintendo in the livingl The kitchen has all new stainless steel appliances and a beautiful tiled backsplash. It is fully equipped to handle all your cooking needs for times when you want to stay in. The bathroom has a tub/shower combo with new tile. Enjoy coffee each morning or catch stunning sunsets on the balcony right off the living room. 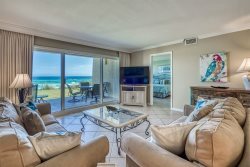 This condo is located close to so many attractions. The public beach access is a short 5 minute walk from the condos. Spend the day enjoying nearby attractions at Crab Island, Harborwalk, Big Kahuna Water Park, or head down to the docks to charter a fishing trip. You are just a short ride on the water taxi ride from hotspots like AJ's Bar and Grill, Harbor Docks restaraunt, Boshamp's Oyster House, or The Boathouse Oyster Bar. Add $85 for housekeeping and 11% for tax. $49 damage protection; 3% to process credit card payments. 25% of the total is due at booking and will hold the unit for you. The remaining balance is due 30 days prior to your arrival.